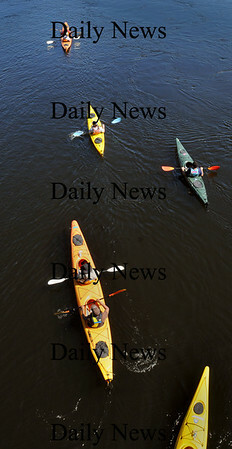 Amesbury: A group of kayakers pull from the under the Hines Bridge in Amesbury heading down the Merrimack River with a strong current Monday afternoon. Outdoor activities may be curtailed late Thursday and Friday as rain may come to the area. Bryan Eaton/Staff Photo Newburyport News Monday September 14, 2009.